Sponsored & hosted by At-Bristol Science Centre/We The Curious. Decorated by Sally Reay & Miss4ire. This piano is available to play until the end of September 2017, after which it will be stored by At-Bristol/We The Curious, it’s new owner, and will only come out for special events in the future. @streetpianos #bristolstreetpianos my 7 yr old Emily playing My Black Cat on one of the fabulous street pianos! Loved it. Lovely location this. 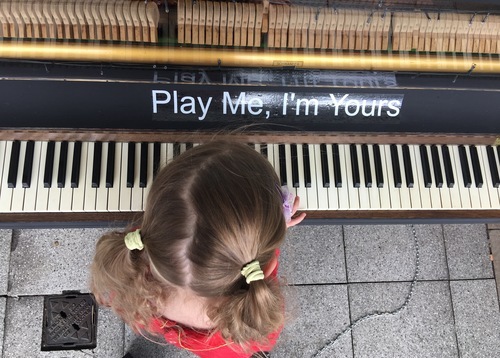 A couple of professional sounding musicians were monopolising this piano while I was there, so it was more of a listening exercise than a chance to play. Still very enjoyable to experience though. Ed from Holland, on a tour of the pianos across Bristol! This blackboard piano will appeal to budding musicians and artists. Kids are already gathering round the At-Bristol street piano - what can you see inside?? ?